Along about 500km of shoreline, where it seems that the world has ripped and torn away at itself, between the northern city of Swakopmund and the Angolan border, which is in the north west of Namibia, lies the Skeleton Coast. For all its bleakness it has a draw on those who travel to Namibia and is a must see place of interest for anyone who dares to feast their eyes on beauty that has a dark past. The Skeleton Coast needs no real introduction to the avid traveller. The area is simply littered with the skeletons – and some believe the lost souls – of whales (from whaling seasons in years gone by), seals and even humans who were involved in unforgiving shipwrecks. An aerial view of this coast line provides an astoundingly beautiful treat for the eyes as a gorgeous green sea laps the crusted shoreline. Dunes as far as the eye can see and from such a distance makes this an area that demands interest, attention and respect. From land however the Skeleton Coast paints quite a different picture. Anyone entering the area is immediately aware as to how difficult victims of shipwrecks would find survival, and how harsh the environment may have been on the animals that once inhabited these parts. The words of Portuguese sailors calling it the “Gates of Hell” and those of the Namibian Bushmen calling it “the land God made in anger” certainly rings true as you cast your eyes upon this natural masterpiece. While the north part of this shoreline is where travellers want to go and explore and discover, access to it is limited to around 800 visitors per year, which makes it generally both exclusive and expensive. Many tourists are taken on trips to the south. Does this make it any less worthwhile? NO! The Skeleton Coast might lean a little towards the macabre, but it has an undeniable allure that you will not regret giving in to. If you are travelling to see the big five then this area is not for you. If you are intrigued by driving through a skeleton wasteland where ship wrecks, tug boats and the lost lives or animals and humans fighting to survive lie as a true life representation of the past, then this dark shoreline beckons and welcomes you with open arms. What can you expect to see while on this type of tour? Your guide will focus on pointing out small insects, mammals and birds and telling their tale of survival in this obviously harsh environment. You will learn how the fog of the ocean provides moisture and how certain beetles work together to provide shade for each other on scorching hot days. It goes without saying that the ecosystem within the Skeleton Coast is somewhat delicate. Those who enter it should do so with caution and make every attempt not to disturb or unsettle anything. Even the routes are only marked out with flat stone markers which thankfully guides are well acquainted with. If this sounds a little dark for you, don’t think that it is all doom and gloom. The unforgiving nature of the area has ensured that this coastline is one of the most pristine known to the world. While macabre, it is absolutely stunning and you will want to snap a few shots to capture the sheer beauty of what surrounds you. What can you expect from a typical tour to the Skeleton Coast? You cannot simply visit this area. All travellers must go with a guide and this means buying into a tour package. You will need to be flown into an inland camp, where your adventure will begin usually with a long drive to dune country, which can be around 200km or so, depending on where your group is staying. Windhoek is a popular area to stay in and offers luxury and standard accommodation options for you to enjoy. Wreck spotting through what seems to be an animal skeleton graveyard is certainly on the cards. A well-known wreck to spot is the Dunedin Star which is a British liner that is said to have sunk in the early 1940’s. A tug boat sent to her aid called the Sir Charles Elliot also sank and can be spotted nearby. A visit to what is known as the “roaring dunes” is something that every traveller to the destination looks forward to. As there are so many dunes and so much wind in the area, the sound of air trapped between sand grains creates a rumbling noise which can be quite overwhelming and daunting. Feel your adrenaline rush through your body as you take to the dunes with a sturdy toboggan to slide down and have a little unexpected fun. The Himba people inhabit parts of these deserted wilderness plains, but it is highly unlikely that you will encounter them while engrossed in tracking desert elephants, hiking through the gorge areas and exploring the never ending natural environment that unfolds as far as the eye can see. Special trips to camps of the natives often form part of the tours to the area and those who are privileged enough to be a part of their welcome will find that they don’t grow anything in terms of crops, have a diet of meat and follow a culture that is perfectly designed to aid their survival in this desert climate. 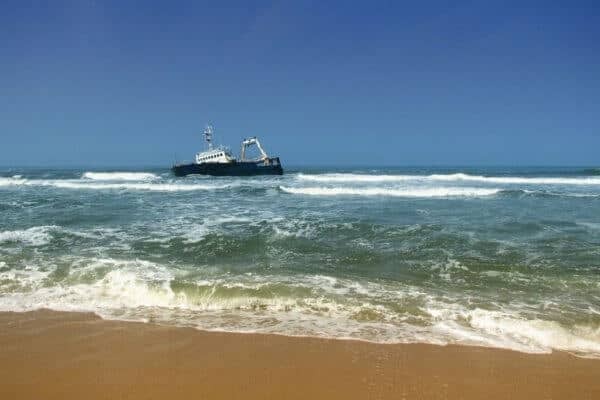 While the Skeleton Coast may seem like a rough travel experience that is not for the faint hearted, it is really one that will touch your life and provide you with an experience that you will never forget, as long as you live. Contact us for more information about the Skeleton Coast or for assistance in arranging your tour of the Skeleton Coast. Click here to return to all of the articles appearing under the article section.